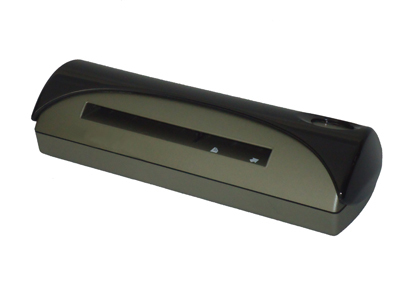 The DocketPORT 667 scans ID cards and licenses quickly and conveniently. Fully USB powered and portable, power adapter not required, scanning resolution up to 600dpi, scans business cards and documents up to 4″ x 10″ size. No matter what mobile means to you, and at just over 8 ounces we’re talking very mobile, the DocketPORT 667 can handle it. Whether you’re on the road capturing business cards or in a hospital scanning patient IDs on a mobile cart, the DocketPORT 667 has the compact size and USB power to go anywhere. The DocketPORT 667 is designed to handle serious workloads. Inside, you’ll find high quality imaging hardware that captures quick, clear images of identification and insurance cards. Outside, you’ll find a durable shell that stands up to continuous use. At just three seconds scan time, it makes quick work of capturing any card. Identification, insurance and business cards are handled easily. Quit wasting time with flatbed scanners. Get the right tool for the job. Takes up far less space than comparable flat bed and automatic document feeder scanners; perfect for both laptop and desktop users. No power cord to pack, the USB power from a laptop is all that’s needed to capture that document on the go. The instant warm-up feature starts you scanning fast. Durable and reliable for frequent and continuous use applications such as healthcare admissions and new account set-up for financial institutions. Delivers ID card or photo scanning at 600 dpi for crisp, clear results in just seconds. Included software conveniently delivers industry-standard PDF output as well as autocrops and deskews automatically. SDK (Software Development Kit) not only for Windows, but also for WinCE, Linux and MacOS for optimum system integration, the included industry-standard TWAIN driver is compatible with hundreds of software applications. Digitize bills-of-lading, invoices and proof of delivery for fast payment.